A group of school children from Bere Alston School spent the day recently learning all about the history of daffodils in the Tamar Valley. 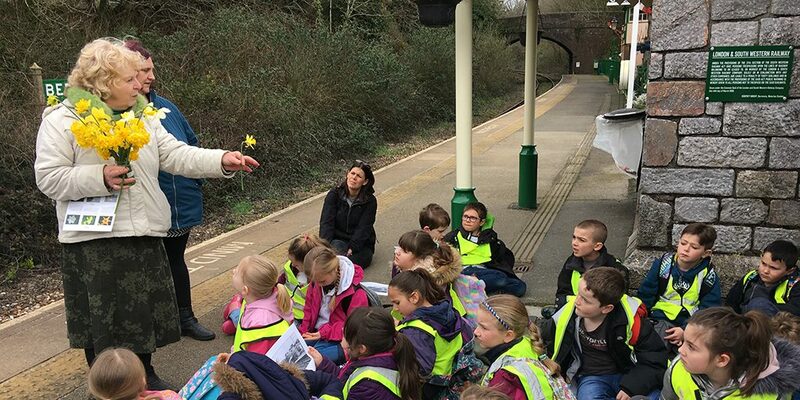 The children learnt all about identifying daffodils from local expert and chair of the Bere Ferrers Spring Flower Show, Frances Howard and then spent the rest of the day spotting and sketching daffodils in the landscape, followed by a trip along the line. Drawings produce by the children will be used to make a poster which will be displayed at railway stations on the Great Western Railway network, to encourage people to visit the area. The day was organised by the Devon and Cornwall Rail Partnership, the local organisation which promotes the scenic Tamar Valley Line, and is linked to the Tamar Valley Area of Outstanding Natural Beauty’s (AONB) ‘Heralds of Spring’ Project. Lesley Strong from the Tamar Valley AONB said “ It’s wonderful to see local children so engaged with the daffodils as they are the guardians of the future for these wonderful flowers that are such a part of the spring landscape in the Tamar Valley’. The Heralds of Spring project is celebrating and recording the wonderful daffodil heritage in the Tamar Valley and raising awareness of this unique historic horticultural collection in the landscape. The Devon and Cornwall Rail Partnership works to promote seven rural branch lines in the two counties and is a non-profit partnership between local authorities, including Devon County Council, Cornwall Council, Plymouth City Council, Plymouth University and the rail industry.